Two weeks before my dinner party, I opened up a bottle of 2010 William Hill Estate Napa Valley Merlot ($30) and enjoyed a glass with friends and appetizers before going out to dinner. I forgot how much I loved this plush, velvety wine, so the next time I found time, I opened up two more bottles of William Hill wines. But first, I wanted to try a new wine brand to my palette: Verde Sole 2012 Pinot Grigio, which I also used in my recipe for chicken picatta, and a Verde Sole 2012 Petite Sirah, both made from grapes grown in the Sierra Foothills of California. Vitone Family Wines brings these wines to New England, thanks to Christian Vitone. Vitone has an impressive resume, starting in the business at age 14 making wine with his grandfather, and as national distributor for Southern Wine and Spirits in 1998. Founded in 2010 after some time spent working alongside Francis Ford Coppola at his winery, as well as his Parisian style Cafe wine bar, Vitone’s passion was realized. I can honestly say that the two wines opened were a pleasant surprise, beginning with the pinot grigio. This wine was served with brie cheese, proscuitto and mozarella, and after I raved about the taste, even the red-only wine drinkers among us had to try it out. And they loved it as well. I’m impressed. And before the guys finished the bottle of petite sirah, I enjoyed a glass of this wine made with grapes from Miraflores Winery. Yes, it was complex, and yes, it was smooth as silk. The addition of a bit of petite sirah port made a significant standout. I would purchase both wines again and again, and not only because the label is “Gatsby”-esque, which I love, but because these wines are as elegant as their labels. So, where can you purchase your own bottles (around $18)? Click here. 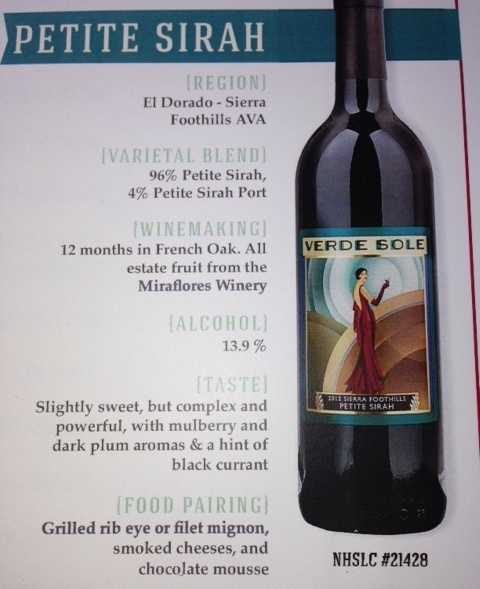 I’ll be trying out a few more Verde Sole varietals soon, so stay tuned for more. In the meantime, visit www.VitoneFamilyWines.com for more information. The next bottle opened was a 2010 William Hill Estate Napa Valley Cabernet Sauvignon ($40) that once again proves winemaker Ralf Holdenried’s talent. Impressive and made with grapes from one of the best estates in Napa Valley, the added petit verdot, petite sirah and pinch of merlot really stunned everyone of us … even the white wine-only drinker who tasted a glass. If you’re looking for a wine that offers a full expression of cabernet character, this is the one to splurge on. Last, but certainly not least, we opened a 2010 William Hill Estate Napa Valley Bench Blend Cabernet Sauvignon ($45). It didn’t matter that it was getting late, and it didn’t matter that we were full. This wine was aged predominantly in new French oak barrels, and it’s sophistication in plush taste and mouthfeel is realized whether it’s the beginning or end of the evening. And this limited edition wine was made with 100 percent cabernet sauvignon grapes from Napa Valley’s best blocks. We drank it to the very last drop.